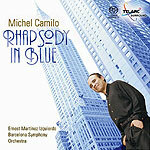 CD review: "Rhapsody in Blue"
This review first appeared in This review first appeared in Turbula in April 2006. Breathing new life into a work that has been co-opted as a television commercial jingle is no easy task  as anyone who has recorded Vivaldi's "Four Seasons" in the past few years can attest. So how to record Gershwin's "Rhapsody in Blue" without sounding like an airline commercial? Perhaps the way a new recording from Telarc does  by going with non-American artists for this most American of all orchestral works. Dominican powerhouse pianist Michel Camilo and Spain's Barcelona Symphony Orchestra have created a reading a Gershwin that is bold, tender, powerful and sentimental all at once  in other words, unmistakably American! Camilo's grounding in the jazz idiom is what makes this work so well. His piano playing shades the theme, rediscovers it with a freshness and vitality that remind us why this piece has been recorded and performed so many times since Gershwin wrote it in 1924. Still, this is a classical version of what Gershwin wrote as a classical work. Camilo does not improvise here  his personalization of the piece is one of nuance and subtlety. The approach to Gershwin's three-movement "Concerto in F" is in a similar vein. More classically symphonic than "Rhapsody," the concerto is not nearly so well-known as Gershwin's more popular Tin Pan Alley material but shows an equally American approach to orchestral music: It is loud, at times garish, inhabiting a space somewhere between Aaron Copland and the Broadway musical. Again, Camilo's jazz sensibilities provide a keen insight into the music, bringing out details and colorings a lesser artist might have missed. And the orchestra provides a thick-pile plush version of the overture that plays perfectly against Camilo's more spare piano. The final work on this release, "Prelude No. 2," is the closest to an actual jazz arrangement; it is a quiet, introspective work, presented for solo piano. It is the one time here that Camilo improvises, riffing off the theme  but slowly, surely, not going too far astray, but decidedly more jazz-like than classical.